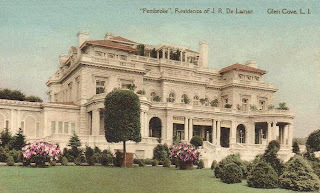 'Pembroke', the Joseph R. De Lamar estate designed by C.P.H. Gilbert c. 1916 in Glen Cove. Click HERE for all of the previous posts on 'Pembroke' (be sure to scroll past today's post). Really nice colorized postcard of Pembroke showing a great amount of architectural detail. Great find. Love postcards that were produced showcasing notable homes of the era. Love, love this too.